Adrenaline rush! 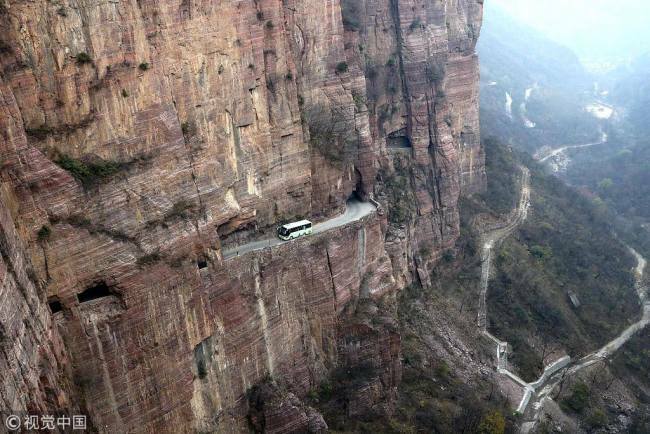 Aerial photos released this month showed a road(路) winding(盘旋) through a cliff in Xinxiang(新乡), Henan Province. The tunnel(隧道) road stretches(延伸) 1,300 meters long(长) and is five meters high(高) and four meters wide(宽). It was dug(挖) by 13 villagers from 1972 to 1977 with only hammers(锤子) and steel files(钢锉). It opened to traffic in May 1997. Wash the dishes, then put them in the plate rack to dry. The highroad winds up the mountainside. Stocktaking today. Business as usual tomorrow.